Tire or wheel balancing is the unique process where you equalize the weight of the combined tire and wheel assembly so that it spins smoothly at high speeds. Balancing involves placing the wheel/tire assembly on a balancer which centers the wheel and spins it in order to determine where the weights should go. We all know how important it is to balance your tires about every 5,000 miles mainly due to the fact that tires become unbalanced unevenly so when you multiply that times 4 tires, imbalance can cause serious vibration at high speeds. Unbalanced tires also put uneven pressure on the treads. Tires will get too hot and wear unevenly and tire imbalance can also strain the wheel bearings as well as the suspension system. So whether you’re an auto shop owner or a simple enthusiast, you’re going to want to purchase a wheel balancer to suit your needs. Now, there a different types of wheel balancers so we advise you to read carefully as we will discuss the different types we offer here at JMC Automotive Equipment as well as their uses. Before we begin by identifying the different types of wheel balancers available it is best if we explain the two most common ways to balance a tire and wheel assembly. The first is “Static” balancing which is done with the assembly stationary and the second is known as “Dynamic” balancing and it requires the wheel and tire to be rotating. Both types can improve tire wear and reduce tire disturbances. About 95% of modern wheel balancers come with both of these options but the more practical and faster way to balance your wheels is with the dynamic option. Static wheel balancing is for wheels that will take weight only on the inside of the wheel. Static balancing uses only one spot to place the wheel weights that measures the imbalance. It is mostly used on heavy truck tires. The imbalance is measured by a static balancing machine where the tire is placed on its vertical axis on a non-rotating spindle tool. In retail shops these balancers are usually non-rotating bubble balancers in which the magnitude and angle of the unbalanced can be seen by looking at the center bubble in an oil-filled glass sighting gauge. Nowadays, this method is used in very few shops. It has been replaced by the more effective method of dynamic wheel balancing. Dynamic balancing requires the wheels to be rotating and it is an improvement over the static technique. With this technique there are weights that are added to both the inside and the outside of the wheels. 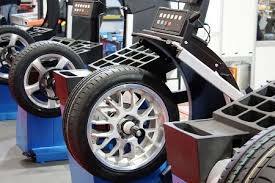 In tire retail shops, tire/wheel assemblies are checked on a spin balancer that lets you know the amount and angle of unbalance. These weights are then fitted to the outer and inner flanges of the wheel. It is the better of the two types of balancing techniques because both couple and static forces are measured and corrected. Premium Wheel Balancers as the name imply are for different kinds of wheels in comparison to their mid-range counterparts. They are engineered to work on bigger as well as heavier tires and have arms that will measure the diameter of the wheels. Premium tire changers’ arms measure diameter distance and they can do this using either lasers or the aforementioned mechanical arms. Premium wheel balancers are also geared more towards multi-bay repair shops as well as professional tire stores that require machines with faster speeds and more accuracy. Learn more about JMC’s Premium Wheel Balancers. Mid-range wheel balancers handle a wide variety of vehicle types and are the most used types of wheel balancers in the industry. They take up less space and are seen a lot at quick lubes and single-bay shops. Their wheel guard size is smaller so they can handle tires that are smaller in weight and in size. Learn more about Mid-Range Wheel Balancers. Diagnostic wheel balancers are usually the most expensive types of wheel balancers mainly because they have more features and some of them come with CCD cameras that can provide a full diagnosis. They are fully-automated and offer touchless measurement and analysis. 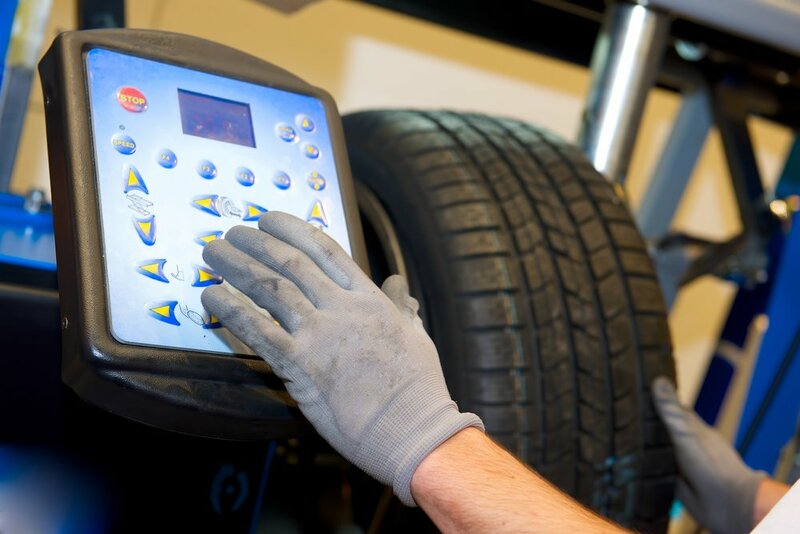 Diagnostic wheel balancers also measure tires for defects as well as bouncing and are ubiquitous at high volume tire shops. Learn more about Diagnostic Wheel Balancers. Wheel lifts are important tools to have in your shop if you see many of the heavier tires come in and out frequently. If you have wheels that come in weighing 30, 40lbs you’re going to need some added support to perform the function of wheel balancing more efficiently. The Corghi TT80 has a lifting capacity of 175lbs. and is built to help avoid physical injuries inflicted upon mechanics by heavy tires. Wheel balancers are important pieces of equipment that every tire shop needs to have to have. They provide shop owners and customers with valuable information as well as insight as to what is going on and how things are running. JMC carries a variety of different balancers from many manufacturers but our highest selling brands are Hofmann and John Bean. These precision cones help ensure a better mounting service to any tire balancer. It might not be a product you can’t do without but it does increase your probabilities of a better mounting service every time. The pin plate set allows you to have more accuracy when mounting tires. They guarantee tires get mounted square to the hub. Allows you to center holes up to 7inches. Tunes the tire for high speed or low speed applications. Reduces the weight put on the tire and doesn’t interfere with the ride of the vehicle. Is an excellent application for fleet vehicles. For a more exact balancing we have the ranger universal lug bolt flange kit with caliper. It consists of focusing pin adapters to fit the majority of import and residential (as well as light truck) lug bolt patterns. They balance the wheel much more efficiently than just a simple cone can do itself. We offer a wide variety of wheel balancers ranging from manufacturers such as Corghi, Ranger, CEMB, Dannmar, Hofmann, Ranger and Tuxedo. We carry over 50 different model types which is proof that we do not take the business of wheel equilibrium lightly. If you wish to learn more about any of these companies or want to know more about how to select the right wheel balancer for your budget, contact JMC Automotive Equipment today.